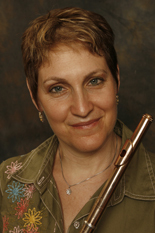 Laura Gilbert, flutist, has performed around the world as chamber musician, soloist, recitalist and guest lecturer. She was co-artistic director of Monadnock Music from 2006-2011 and is co-founder and co-artistic director of Electric Earth Concerts, based in Jaffrey, New Hampshire. In addition to founding and performing with Auréole, a trio comprised of flute, viola and harp, Ms. Gilbert has appeared with Musicians from Marlboro, Alexander Schneider's Brandenburg Ensemble, the Borromeo, Brentano and Saint Lawrence String Quartets, Chamber Music at the 92nd Street “Y ”, Saint Luke's Ensemble and Orchestra, The Metropolitan Opera Orchestra, The New York Philharmonic and Speculum Musicae. Ms. Gilbert also performs frequently in a duo with the Greek guitarist Antigoni Goni. As advocates of folk-inspired classical music, the duo has commissioned numerous new works, many of which are included on their debut solo disc “From the New Village” on Koch International Classics. Ms. Gilbert's extensive discography includes a Grammy award for Dawn Upshaw's “Girl with the Orange Lips”, two solo recordings on Koch International: The Flute Music of Serge Prokofiev, and the Flute Music of Toru Takemitsu. In addition to her solo recordings, Aureole has released nine discs on Koch International, the first of which was short-listed for numerous Grammy awards. Ms. Gilbert has been a grant review panelist for The National Endowment for the Arts, Chamber Music America, Meet the Composer and the National Flute Association. She has served on the faculties of Peabody Conservatory, Mannes College of Music, Harid Conservatory, Purchase College, The Aaron Copland School at Queens College, Bowdoin Summer Music Festival, and Saint Ann's School. Ms. Gilbert studied with Samuel Baron, Julius Baker and Thomas Nyfenger, and received her Bachelor degrees from Sarah Lawrence College, and New England Conservatory of Music, her diploma and Master of Music from Juilliard, and her Doctorate from SUNY Stony Brook.